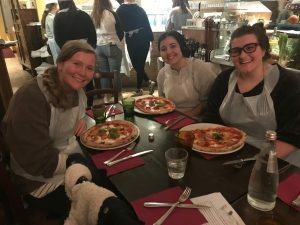 With my roommates, Madeline and Cami, at pizza making class the day before Thanksgiving. 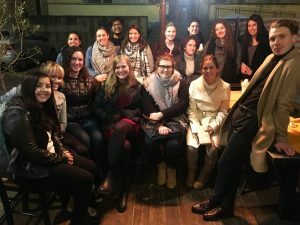 On Tuesday, my roommates and I joined SAI for a Thanksgiving-themed aperitivo. Not quite the food I would’ve eaten at home, but the pizza was great. On Wednesday, after an amazing pizza making class, we decided to attempt a homemade Thanksgiving dinner because most of us had classes all day on the actual holiday. We had to switch up our menu a bit, as we were unable to find a lot of the traditional American ingredients. My roommates and I (plus a bunch of other people) at SAI’s Thanksgiving-style aperitivo event. Our Friendsgiving featured latkes, baked brie cheese, corn bread, roasted vegetables and mini apple pies. I love that we were able to make the most of what we have here to put together our own Thanksgiving feast. None of my roommates or I had ever been so far from home for the holidays, so it was nice that we could share the experience together. 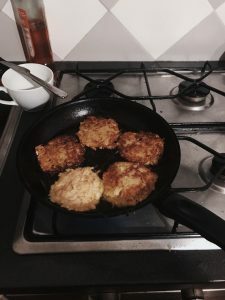 The latkes my flatmate Emily and I made for Friendsgiving. Thankfully, Florence has now begun preparing for Christmas, and I can spend my evenings searching for new lights and displays to admire as I sing, “I’ll Be Home for Christmas” to myself. 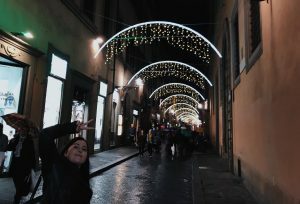 The Christmas market at Santa Croce opens this week, and I can’t wait for that excuse to shop for my friends at home (and myself) after class every day. Maddie is a fall 2017 SAI Florence student from the University of Nebraska-Lincoln.